MakeCode Arcade supports a 160x120 screen showing 16 colors at a time (you can change the palette though! ), a 4-channel retro-appropriate sound system, and a grand total of eight buttons (4 directions, A, B, MENU and RESET). Arcade comes with a 2D game engine with sprites, platformer-style collisions, tile maps, particle systems and more. Scene definition, tilemaps, collisions and camera position. Moreover, the system allows extensibility through packages (extensions) pulled from GitHub, the largest source code hosting site in the world. Students can even collaborate on projects, or even their own extensions, using our GitHub integration. Once you have created a game, you can share it with your friends through an anonymous URL (web address). 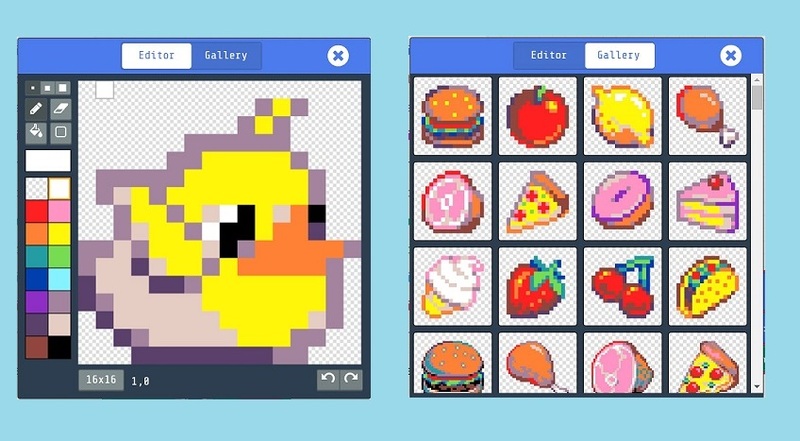 The generated web site will let them play the game (including on their smartphone), and also give them option to look at the code, or make their own version of it. You can also save screenshots of your games while playing. We call these cartridges, since they contain the sources of the game, hidden steganographically in magical pixels. Once saved, anyone can drag these cartridges to the editor to load them. You can use it for emailing of projects, or sharing them on forums. Speaking of forums, we have created an experimental forum to share your games. 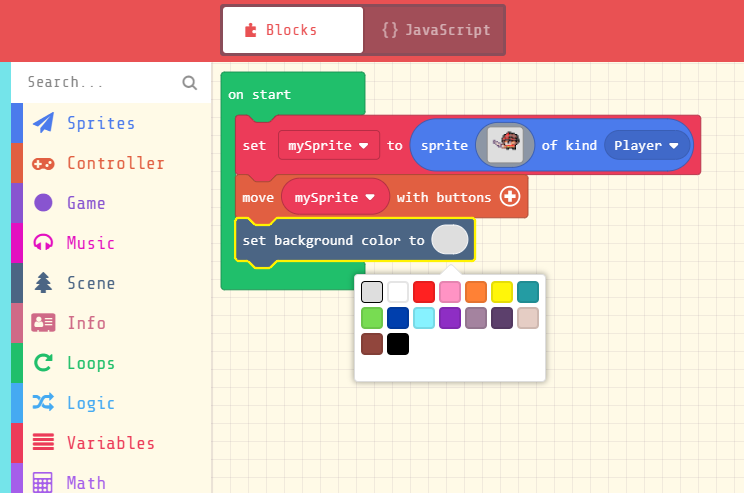 MakeCode Arcade games run in any modern web browser. This includes the one on your smartphone! But we also have some dedicated hardware with more tactile controls and a more retro look. You can play MakeCode Arcade games on a Raspberry Pi Zero connected to a TV. You can either use a small controller shield, or build your own arcade cabinet using old-school joysticks and buttons. There is also hand-held hardware coming, based on mid-range microcontrollers. You can build your own today and soon you’ll be able to buy pre-made consoles! All options are listed on our hardware page. Arcade supports a 1.77” 160x128 SPI screen with 18 bit color, but draws only on 160x120 of these pixels, so we can use 320x240 screens in future with 2x up-scaling; the bottom 8 pixels are used for displaying frames per seconds and other similar debug info (if requested). 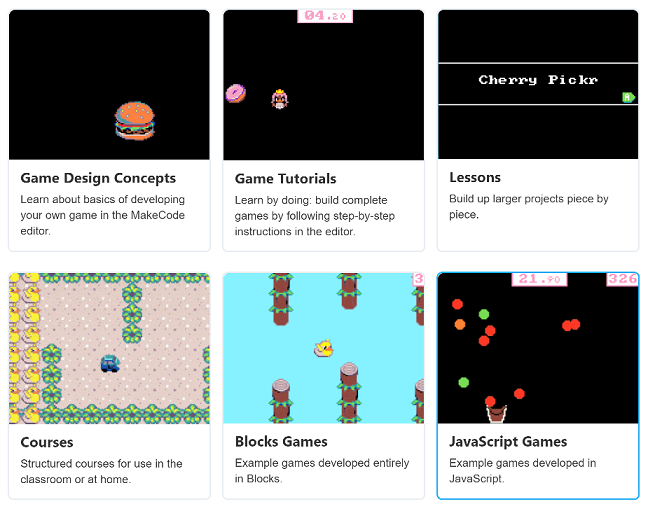 We’ve created a fantastic set of resources for learning how to create your own games, including game design concepts, game tutorials, and a semester-long course. 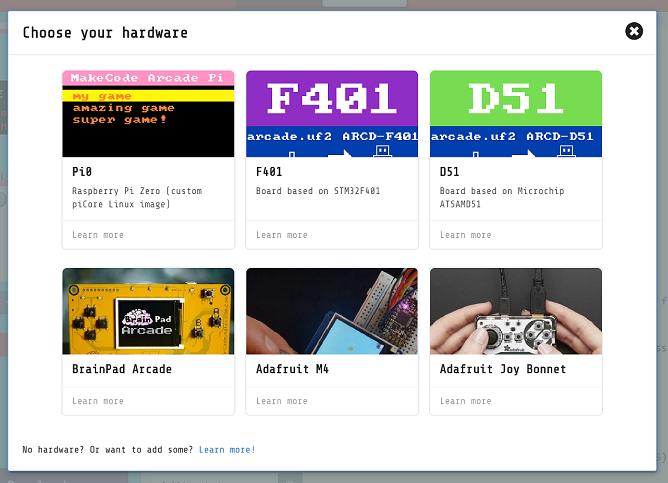 If you have questions or feedback regarding MakeCode Arcade, please use the forum. For live chat, you can use our Discord chat. Bug are best reported in Arcade GitHub repo. You can also use the forum if you find that easier. Last, but certainly not least, make sure to share your games, either on the forum, or on social media (best with #MakeCodeArcade hashtag).